The best way to accelerate your learning is through private lessons. I will teach you the fundamentals of social or competitive dancing on an individual or group basis. Fee is $70** for a 45-minute lesson, $100 group class. Gents, although I will teach you separately, I recommend you take lessons from a female teacher. Talk to me about recommendations. Formation team is a great way to get your feet wet if you want to start performing in ballroom dance. 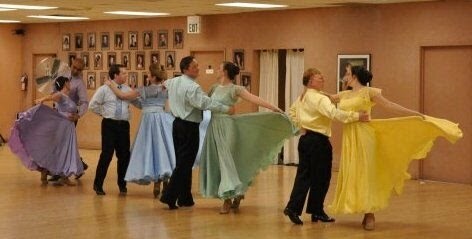 You will learn ballroom patterns, and how group choreography works, while working in a team atmosphere. It's great fun. Check out our Formation Teams page for more information. Performing in a solo routine is another great way to really work on your dancing. You will learn choreography to a particular song, and perform that dance at one of Bud's showcases, or elsewhere. There's no better way to work on your technique than in a private lesson with a deadline! I help couples with their wedding dance. It's a wonderful way to celebrate your love and the start of a new life together. These are 6-8 week progressive courses that are offered through the Sunnyvale Community Center. oth the leaders & followers will need the ability to spin. We rotate partners, no partner is ever required for any of our classes or dance parties. For the current list of classes, days & times see City of Synnyvale Adult Classes click here. For registration & other information click here. Please, no tennis shoes or flip flops to any of the classes; both the leaders & followers will need the ability to spin.